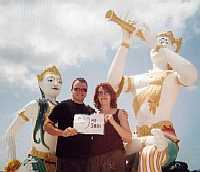 So far we have messages from six continents. 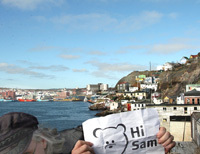 We’re just missing South America – so if you’re going, please send Sam a message! Here’s a few of our favourites…. Esta noticia me ha impactado mucho, admiro la dedicación de estos padres por su pequeño, pero quitarse la vida no es una buena idea aunque realmente el dolor de perder un hijo debe ser muy fuerte, sólo deseo que ahora estén en paz. brave brave brave – completely understand, touched. My heart breaks for you all – you were so very brave. As a reminder of such a brave little boy, and his mother and father. I was so shocked to hear of this most terrible news. Sam was very much loved by so many people across the world, most importantly his mummy and daddy who simply adored him and always wanted to be with him. 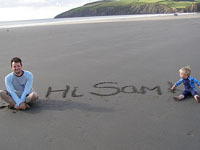 In his short time on this earth Sam radiated love and fun – thank you Sam. They are all in each others arms now, free from pain and heartache. Oh, such a shocking and sad story! I hope there is a place where they could all RIP! HE LEIDO ESTA NOTICIA Y ESTOY IMPACTADO, REALMENTE EL AMOR HACIA LOS HIJOS ES LO MAS GRANDE QUE EXISTE, QUE DIOS RECIBA EN SU GLORIA A SAM Y SUS PADRES, MIS MAYORES RESPETOS. such nice kid,such wonderful couple and parents. of what a person,a couple,and a family is supposed to be. Neil , Kazumi , Sam , may God unite you in Heaven. 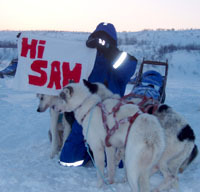 First time knowing about sam today, too late, crying right now. SO SORRY , SO SAD ! A wonderful, brave family, together for eternity in a better place, free from pain. May you all Rest in Peace. It is so humbling to read personal messages of condolences from parents who know too well of what Kazumi and Neil were feeling. I am a feature writer for the women’s magazine Closer and I wonder if you may contact me for a piece I am writing about parents losing their children. If you felt compelled to leave a message perhaps you would want to chat? If you want to get in touch please e-mail on lisa.woollard@closermag.co.uk or call 0207 859 8449. I can understand the desperation of losing your loved one. He was a very happy child and a true inspiration for all. Good-bye. 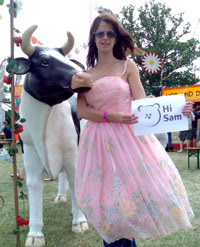 Sam, thank you for your smile and your bravery. You were a beautiful and bright light when you were here. May you find true peace and rest with your loving parents. No words. I will pray for their souls. So sad! I hope they are happy now in a betetr place, together! I did not know you Sam or your Mummy and Daddy but I will never forget your life story. Your Mummy and Daddy really loved you, if only all the children in this world were loved so much. This is the first time that I have known about you & your family. So touching and sad but completely understand what’s going on there. I know you & your brave parents are not there anymore but I still want to leave a message for you. May God bless you all in the heaven. RIP. While I am not a religious man, I disagree with suicide – in my mind there is always be a reason to keep on. What would Sam have wanted? How is his memory and legacy served by this? Having said that, I have two little girls and can (I think) appreciate the dark despair and utter grief that would overwhelm a parent upon the death of a young child. The mere thought of burying either of my children is something I cannot bear. For me the tragedy (as with any suicide) is that the path was so dark that there seemed no way out. The tragic story of the Puttick family and the nightmare that they couldn’t find an escape from will live with me for a long time. I grieve for the three of them. I’ll give my girls an extra tight squeeze when I get home tonight. So from Justin, Linda, Chelsea and Kristen in Australia – RIP the Puttick family. logic says you are right Justin. Unfortunately this is not a logical situation and while I do not believe in suicide either, I can’t begin to imagine the despair Kazumi and Neil felt. Just the sheer exhaustion from their efforts would’ve been enough to drive us all to despair. Justin, try living with a severely disabled child – coping with all the grief, dealing with the unbelievably hard work involved and enduring the constant worry we parents face – and maybe then you’ll have the necessary wisdom, experience and compassion to allow you to question Neil’s and Kazumi’s decision. 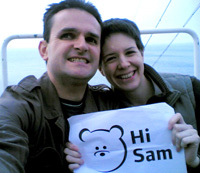 Neil and Kazumi….bless you for being the wonderful parents you will always be to your darling Sam. Knowing you are all together once more in love. I’m deeply saddened with the news. Little boy with courage and loving parents. RIP. after I read your tragic story, just want to send my sympathy on you all. may your loving family rest in peace. Solo deseo que esten unidos y felices en donde sea que esten!! su legado es hacernos ver que no hay mas nada importante que la familia… que Dios los tenga en su gloria. I am so shocked by this sad news but I think I understand what you did and why you did it. I am a Japanese wife to an English man, like you Kazumi-san. One of my boys is also called Sam. 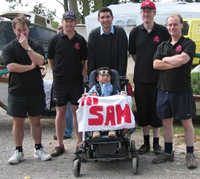 The news headline says “Life without Sam meant nothing to his parents” but it is so untrue. I think that it was not the devastation that made you jump but a determination to care for Sam in the afterlife made you go with him, so that you can continue caring for him and loving him. You took Sam’s toys with you so that Sam can continue playing with his favourite toys surrounded by his wonderful loving parents. I agree completely, Aya. When I heard about the toys, I thought the same thing. I hope they got their wish. 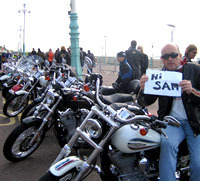 I never knew about Sam and his family until the recent sad news. My family would like to say that our thoughts are with them, and their family. I hope they all find piece and are re-united somewhere where they can play and love together. desde españa mando un pesame muy fuerte a todos sus familiares y amigos, ya que eh visto la noticia y la verdad me a conmovido. No se lo que se puede sentir al perder un hijo pero esos padres han dado todo por el y espero que ahora esten donde esten sigan cuidando de su hijo. Un abrazo muy fuerte para todos los familiares y amigos de esta gran familia que tristemente han dejado de estar a nuestro lado pero no en el corazon. To hear of anyone suffer is tragic, but when i heard of the multiple suicide i was shocked. I now completely understand why you took your own lives. Having looked after such a beautiful little boy and devoted alot of time and effort to raising awarness for the named charities i cannot even begin to understand the pain of your loss when he passed away from meningitis. I would feel the same and not even start to understand what the future held after loosing your love and joy so tragically. May you all rest in peace in heaven. God bless all of you. 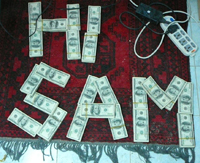 Dearest Sam and your mummy and daddy. Your story has touched my heart. What a brave little boy you have been, so much to deal with and yet it seems you touched the hearts of everyone you met. Your Mummy and Daddy clearly loved you so much. I truely hope you are all together enjoying a cuddle forever. My thoughts extend to your extended family and friends too. Bless you all. I was truely touched by the story of Sam and his loving parents, may you all rest in peace. I heard about Sam and his parents on the radio and then looked at this site- it is full of happy smiling photos of Sam and of his devoted mum and dad. 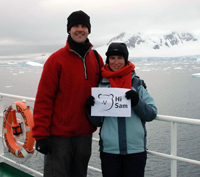 Sam’s parents are truly inspirational in the way that they fought to get the happiest life for Sam possible and it is clear that this was achieved for Sam. It must be heartbreaking for those left behind who were close to Sam and his mum and dad- I hope that they focus on the smiling faces and devotion and seek comfort from this. I am so sad to hear about what happened. and most caring parents in the world. I have never been so touched. 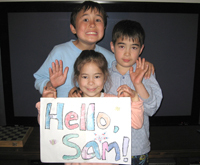 Kazumi and Neil were the best parents ever and Sam seems to have been the happiest child in the world. I leave you my most deep and felt sympathies. Kazumi and Neil’s last “walk” was an act of great love. Nothing more. Someday, we will be watching in a Theatre a movie about all of you and it will be one of the most beautiful movies ever. Where is justice for good people in this world? At the end, life turns into dust and love is gone forever. The person who caused Sam’s accident, did he or she not reflect his/her one moment of error? One mistake cost the lives of a beautiful family. I am not a religious man, but please have the grace of God in your heart whenever you deal with life!!! Que deus continua confortando toda a familia. I always say there is no love like the love you feel for your child. None of us can possibly know how Sam’s Mummy and Daddy felt once their beautiful little boy passed away. The only thing I can imagine they were thinking is that they were inseparable in life, and they wanted to be inseparable in death. I just cant hold my tear. my heart stopped beating. I undertand how they fell, no parents can take that pain. My heartfelt best wishes as you are all now reunited and with the Angels in Paradise. 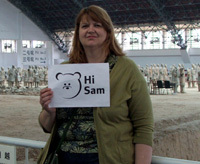 so deeply touched, by the photos of sam, always beaming, and the sadness of the whole story. my thoughts are with family and friends. My heart goes out to all those affected at this difficult time. 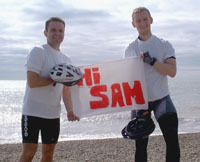 God Bless you sam, Neil and Kazumi such wonderful wonderful people i feel so privaliged to have known you all. Was für eine Tragödie :(. Just wanted to say how shockingly upsetting this case is. For such a gorgeous little boy to go through everything with the accident in 2005 and still be able to smile as he did with that heart melting smile to only be struck down with meningitis and not make it. The desperation that his Mummy and Daddy must have felt is uncomprehendable. I lost my own daughter in 1997 at 41 weeks pregnant and we never found out why she died and that was the hardest thing I’ve ever had to deal with, but to lose a child at Sam’s age I cannot even begin to imagine the pain and utter devestation Neil and Kazumi must have felt. All I can say is that from now on, there will be 3 brightly shining stars over Beachy Head and having been born in Eastbourne myself, I will always think of the Puttick family whenever I think of Beachy Head now, even though I didnt know them. I hope their families can try and take comfort in knowing that they are all together, forever more. God bless you. Allah rahmet eylesin. yo tengo hijos y no pudo imaginar que haria sin alguno de ellos, por eso no censuro la desicion de los padres de sam, solo pido de corazon que esten juntos los tres. cuando pasan estas tragedias pienso porque malos padres tienen hijos y los maltratan y padres exelentes como los de sam, pasan por este sufrimiento?????? Dios, por favor ayuda a que cada dia haya menos padres maltratantes y mas padres amorosos. deseo desde lo mas profundo de mi alma, que exista esa otra vida en el mas alla y que sam y sus padres esten juntos. Descansen en paz. Amen. This story saddens me so deeply… And my deepest sympathies go to the remaining members of this amazing, selfless family. Although I never had the honor to know you, your lives have made a deep impression on me. The connection you three felt (and still feel?) is unmeasurable. May your connection endure into infinity. 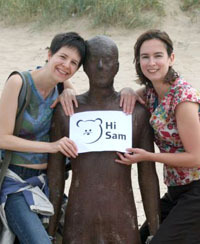 To Neil, Kazumi and of course Sam! My thoughts are with your friends and family at this difficult time, I know how hard the death of a child hits families, it’s just such a tragic waste of three amazing lives. Sentí que el corazón se me apretaba cuando leí esta noticia, no podría soportar el perder a un hijo. Pido a Dios los comprenda y los reciba el el paraiso pues lo que hicieron lo hicieron solo por amor a Sam. Desde chile lamento profundamente lo ocurrido con SAM y sus PADRES, es un hecho muy trágico, pero nos demuestra todo el amor que nosotros los padres sentimos por nuestros hijos y todo lo que podemos llagar hacer. Una decisión así, es muy difícil de juzgar y solo queda el consuelo para los familiares y el apoyo de toda la gente. Pequeño Sam, Kazumi y Neil….que gran prueba de amor han demostrado a un mundo tan egoísta como el nuestro…ahora son felices porque están todos juntos…y esa paz que no encontraron en la tierra, sé que la encontraran en la eternidad…Dios los bendiga y que su gran gesto de amor sea siempre recordado en nuestras vidas. No me podía quedar sin expresar mi admiración por el increible amor demostrado por esta bellla familia, no se lo que sentiría perder a mi hija y doy gracias a Dios porque ella ademas este sanita, por eso comprendo el incondicional amor de ellos al hermoso Sam, mi más sincero sentir a sus familiares y amigos. Mi oración esta junto a ustedes y se que Dios tiene ya a tres nuevos Angelitos en su reino. No puedo describir la pena que me invade en esta noticia a pesar de ser tan distante, pero me llena de alegría saber que en algún lugar estan juntitos compartiendo ese amor eterno que nos han demostrado a todos en el mundo. Mi fuerza y mi cariño a ustedes. Y que ese Amor Eterno los tenga unidos mas que nunca. Esta noticia me ha impactado mucho, admiro la dedicación de estos padres por su pequeño, pero quitarse la vida no es una buena idea, aunque realmente el dolor de perder un hijo debe ser muy fuerte, sólo deseo que ahora estén en paz. Meine Gedanken sind bei Euch! Ich hoffe, ihr drei seid nun wieder zusammen in einer besseren Welt. Mein Herz ist erfüllt von tiefster Traurigkeit, denn auch ich bin Vater und kann Eure Gefühle nachvollziehen! Ich werde eine Kerze für euch entzünden, und euer Andenken erhalten. My heart goes out to you and your mummy and daddy, you will all be missed by many. May this family rest in peace, you will never be forgotten !! My Thoughts are with you all. Estaba preparandome para ir al trabajo cuando escuche esta tragica noticia. No los conocia y aun asi, comenze a llorar incontrolablemente, he visitado la pagina de Sam, veo cuanto amor existia en esta familia. No los puedo reprobar, su dolor era demasiado grande, nadie esta preparado para ver morir un hijo, no es natural. Kazumi y Neil su amor era increible e incondicional, fueron excelentes padres. No dejaron solo a Sam, nunca. Ahora estan en paz, ya no hay dolor ni sufrimiento, ni para ustedes ni para Sam. Me conmueve este amor tan entregado, tan completo, tan dificil de encontrar hoy. Siempre recordare este suceso, y lo usare de ejemplo mientras viva. Amemos a nuestra familia, digamosle a nuestros hijos cuanto los amamos, abrazemoslos mientras los tenemos, manana puede ser tarde. Mis mayores respetos a su familia en su dolor. Sin Duda Que Ningun Padre y madre Esta Preparado Para Tener Que Enterrar A Un Hijo…. El amor de estos padres es la muestra. Q.E.P.D. Hi Sam and Neil, Kazumi. i´m incredibly sad hearing the news… your beautiful and captivating smile won´t be forgotten! Rest in peace with mummy and daddy who couldn´t live without their beloved son. My prayers from now on will be with you and your loving parents. may God bless you and your family. Sam, you endured so much in your short life. 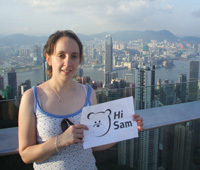 Neil and Kazumi, I didn’t know you, but you seemed so devoted to Sam, I am so sorry and upset for you all. My prayers are with you. I read the story that was published in Australian papers today. Sincere sympathy to their families. May the story of the love of a family touch families around the world. RIP all 3 of you. they are happy together, somewhere better. This family knew and demonstrated the greatest love. They are now wrapped together in the eternal love of God. Only found out about Sam and his parents today, just now read the tragic news. Rest in eternal peace. Sam, your parents loved you so much and reading about their absolute dedication brought tears to my eyes. God bless you and your parents. Bold white cliffs, a perfect day. Up from the busy pier. And the cliffs were a means to an end.